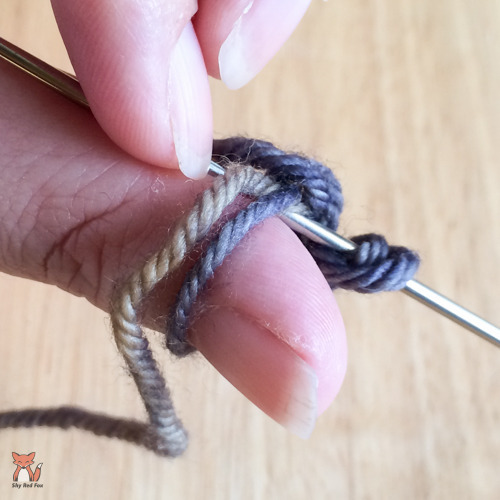 We’ll start building up loops on and behind our thumb for a nice clean start to our work. There’s more than one way to do this. Here’s my favorite. 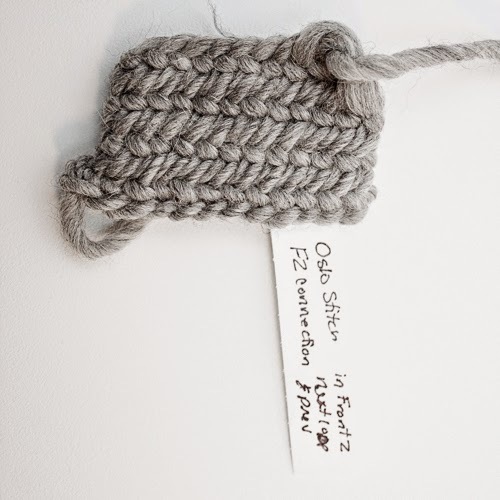 I’ll be setting up for Finnish 2+2 stitch. 1. 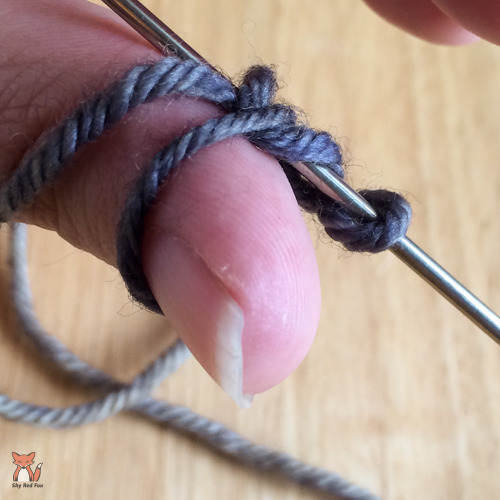 From inside of thumb to outside of thumb, wrap yarn around thumb (over nail and around) twice. 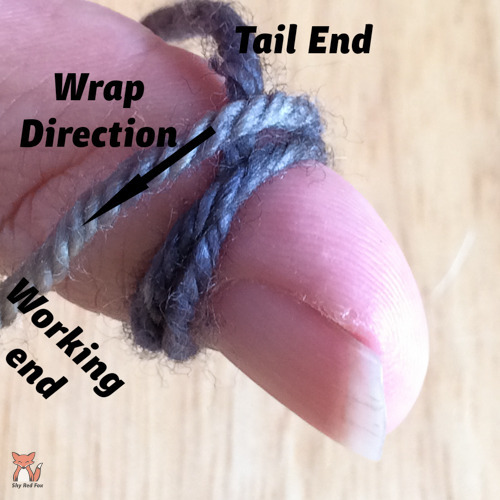 The first wrap should go over the tail to lock it down. 3. 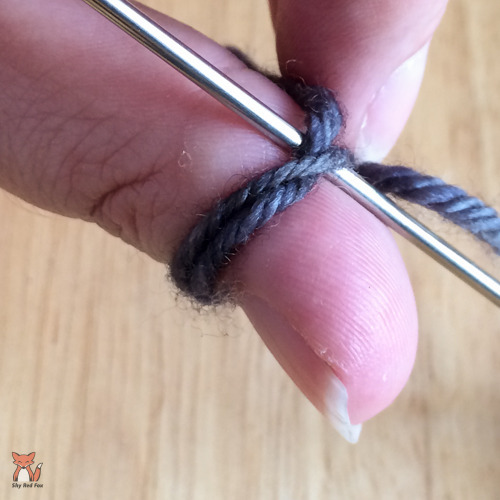 Pull top loop off thumb to do an Oslo Stitch (1 on thumb, 1 behind thumb). 5. 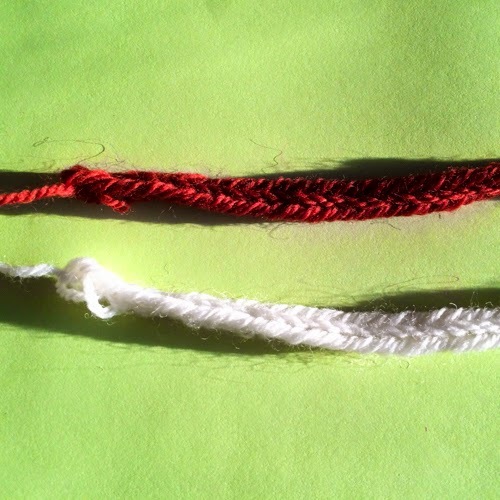 Now you are ready for Finnish 2+2 (2 on thumb and 2 behind) in the same 2 loops behind thumb. (St number 3). Now you’re ready to go with more Finnish 2+2 stitches in the usual manner. 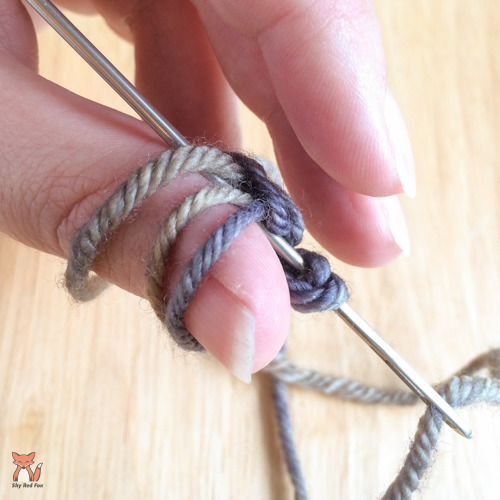 This same build up start can be used when attaching a new row to an existing row of work. 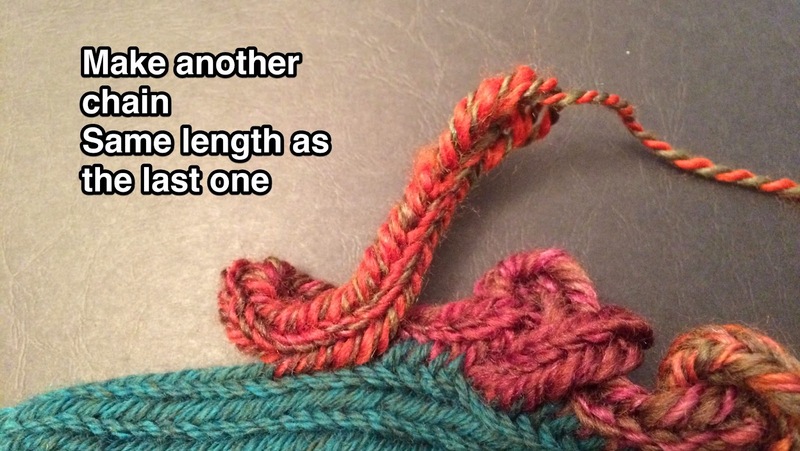 (Say we want to add a short row for shaping, or attach another strand to make a braid, etc.) 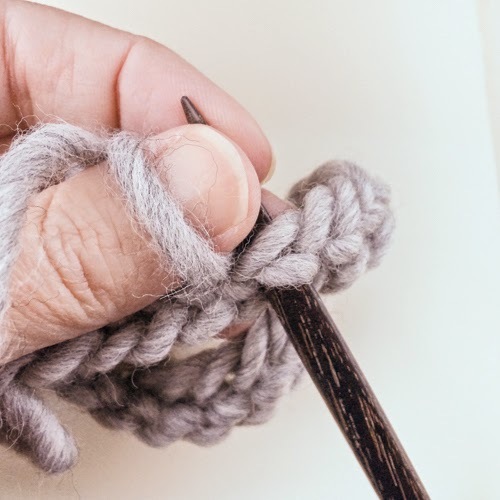 Just put the two loops on your thumb and push one back, then pick up the loop of your stitch on the existing work and continue your new stitches as you would in the directions above. The PDF for this can be downloaded from Google Drive. 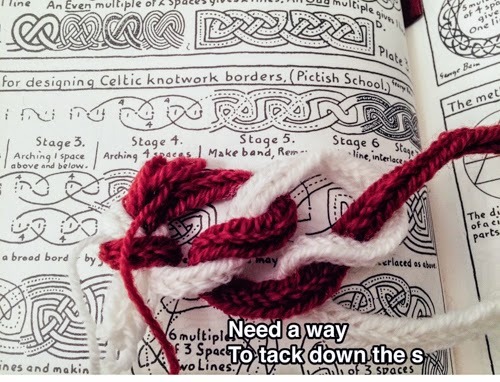 Last night I attempted 3 more knots as I work through my old knotwork book. Two of which were good. The first one was my “fail” for the evening. But it was worth trying. I learned I’ll have to tack down the looser shapes like the “s” or “z” so they stay put. 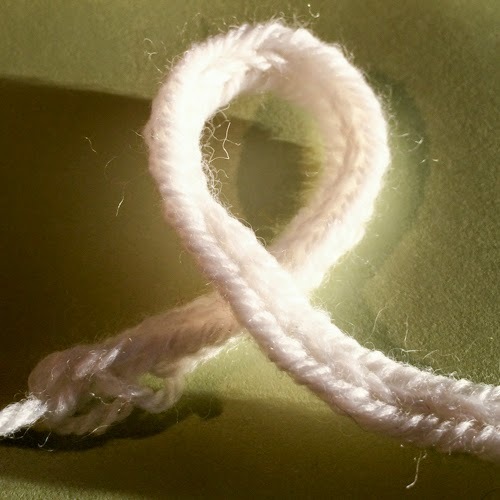 I won’t just be able to make a chain of stitches and make this knot. 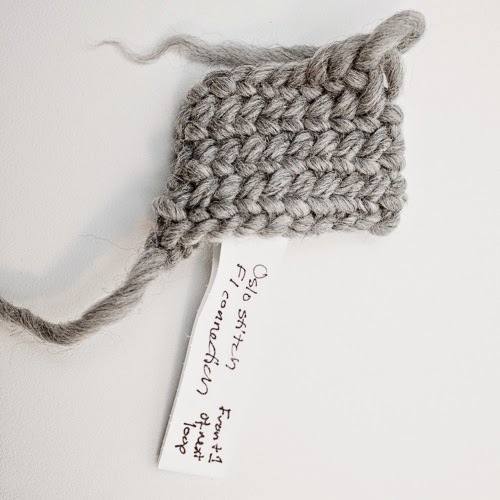 It will have to be more planned and after so many stitches I’ll have to attach it to the other chain of stitches. Otherwise, it won’t hold together well. And this one really surprised me, I thought it wouldn’t work with the longer loops to the next knot. 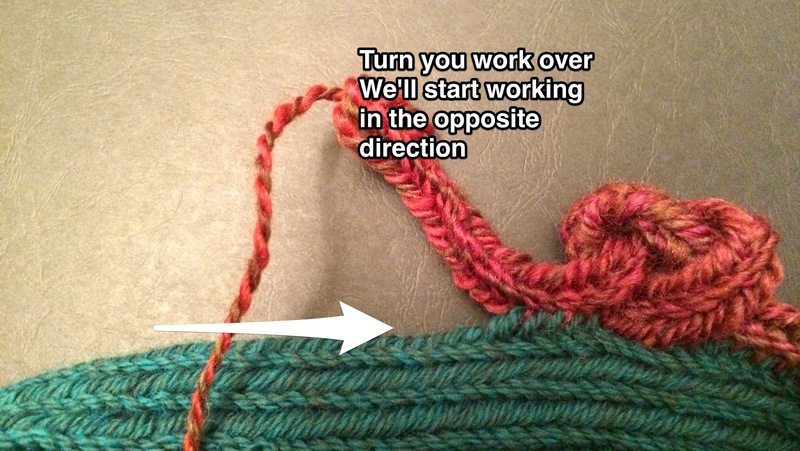 But when tightened it worked out well. What in your projects and experiments has surprised you? Yes, yes. I should be working on my circle vest to have it done before the end of February for the Green Camel Gathering fiber arts event. But I got distracted, you see. 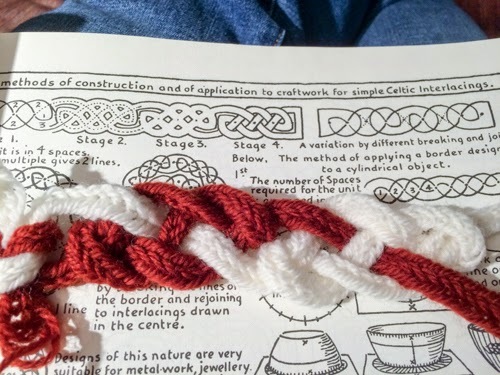 A spiffy knotwork headband post from one of the Facebook groups inspired me this week to start to learn how to do knotwork in nalbinding, beyond braids. 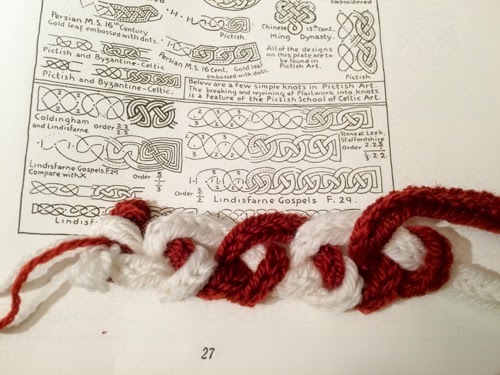 I’ve always loved Celtic and Viking knotwork, thus I was dragged (not unwillingly) into another project. Thankfully this one went quickly! 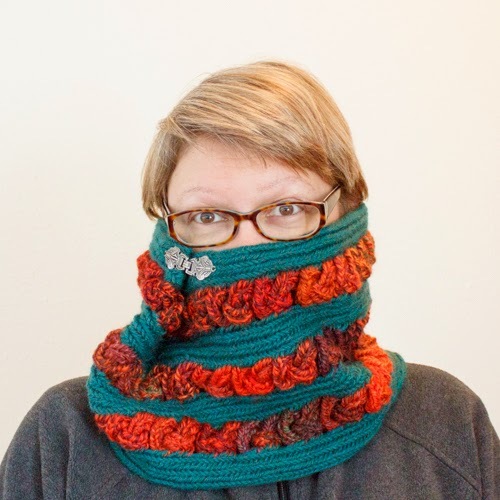 It’s been wicked cold out (windchill -20°F/-28°C to -30°F/-34°C) this week, so a cowl was the perfect project. 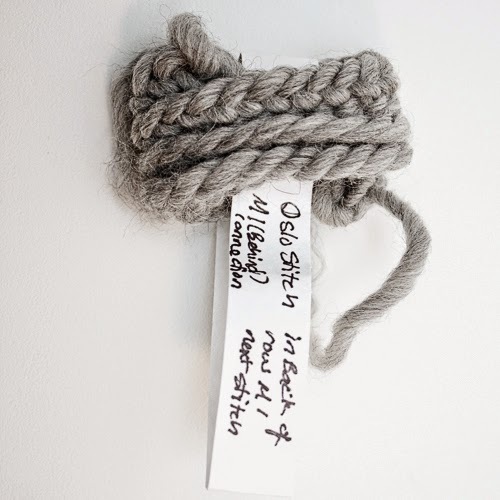 Nalbound cowl with knotwork – done in Finnish 2+2 stitch. A Celtic looking clasp was the pefect closure for this, to help tighten it against my face. I couldn’t resist putting the needle in the picture too. Hubby made it from red heart wood and gave it to me for Valentine’s Day a few years ago. The cowl with the clasp undone. 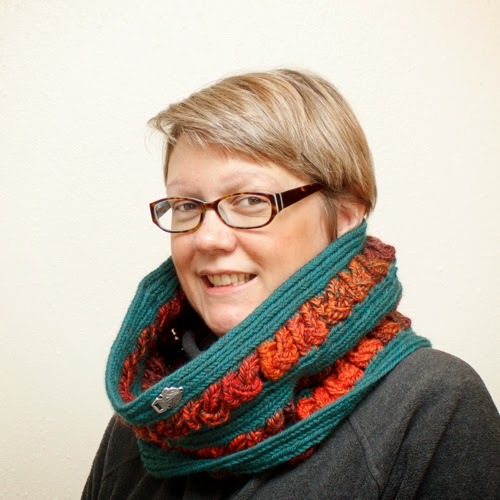 I’m trying not to giggle as my son snaps the picture of me in this cowl indoors. 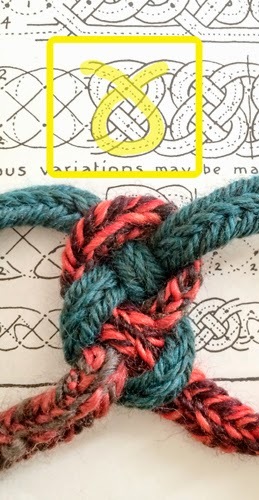 To help my fellow nalbinders with knotwork of their own (since it took me a couple tries to be able to make them consistently), I took pictures of each step for making the little pretzel knots. 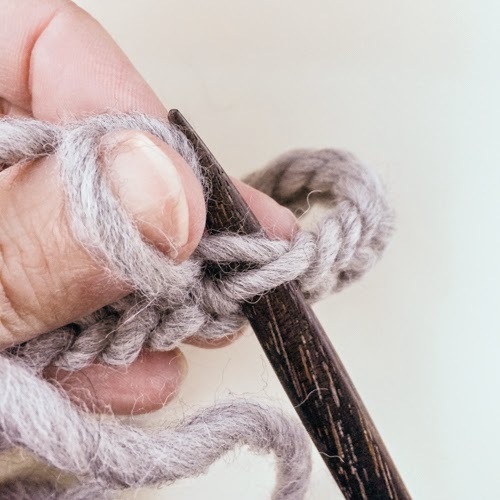 (They’re actually overhand knots – but they look so much like pretzels!) 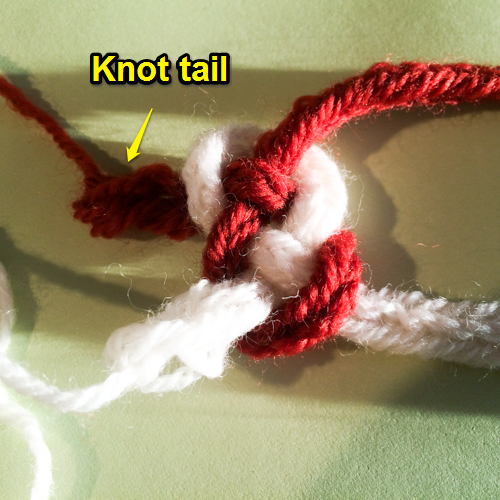 Hopefully this will also help me remember how to do the knots too. 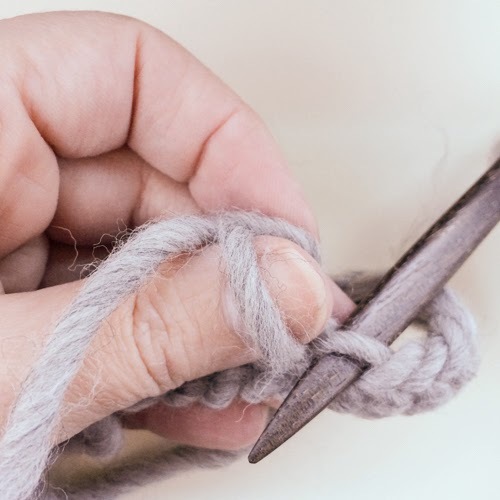 To start, I’ll recommend making a pretzeloverhand knot and measuring it against a flat row of stitches, so you can get the width in stitches of your knots and how many stitches for each section. Attach your work to row. 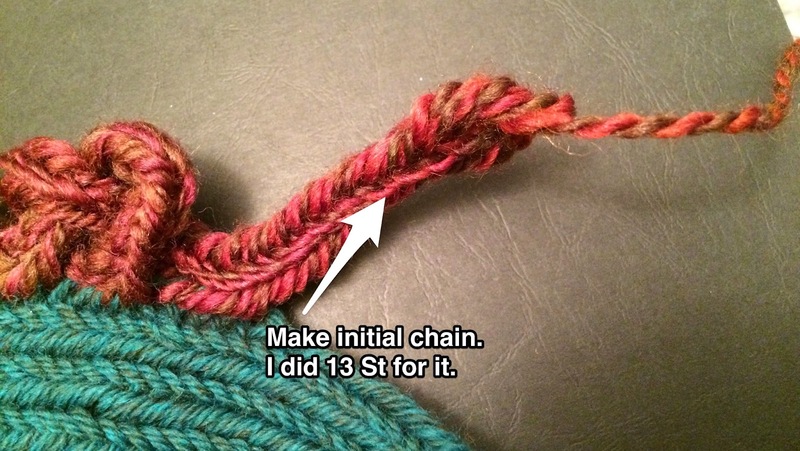 Make a chain of stitches. Turn your work over. 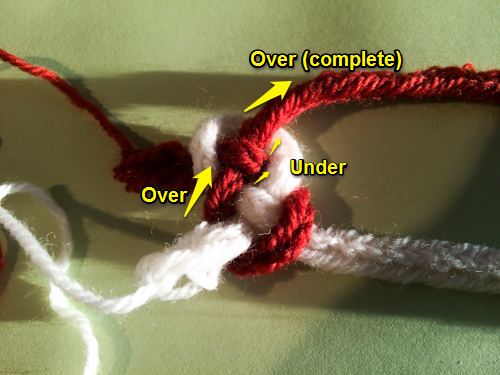 Count over from your attached work half the width of your test pretzel knot. 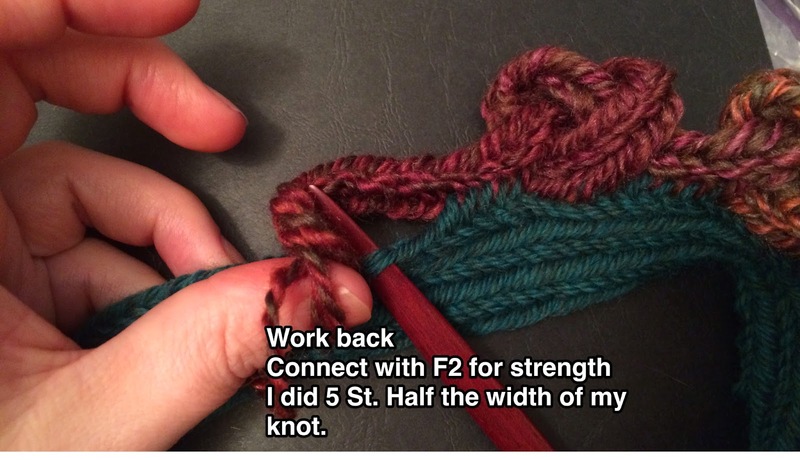 Work with F2 connection (for strength of the join) back to last joined work. 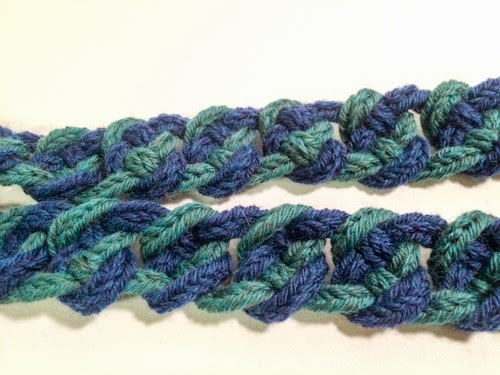 Create another chain, same length as the last one. 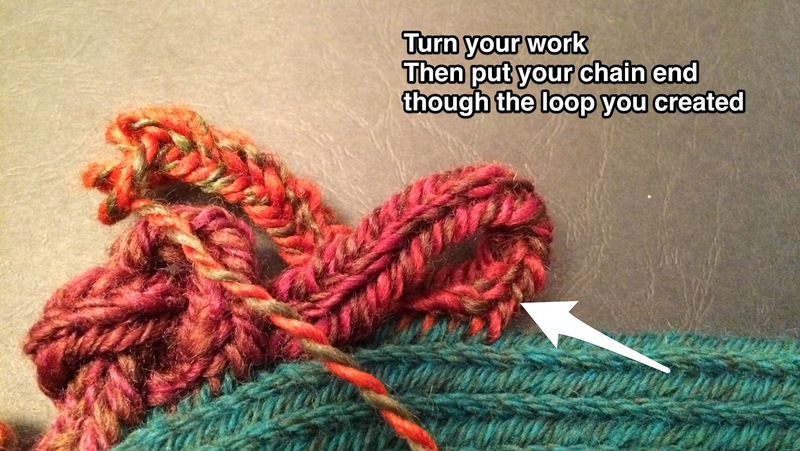 Turn your work, then put your chain end (with the working yarn and needle) through the loop you created. 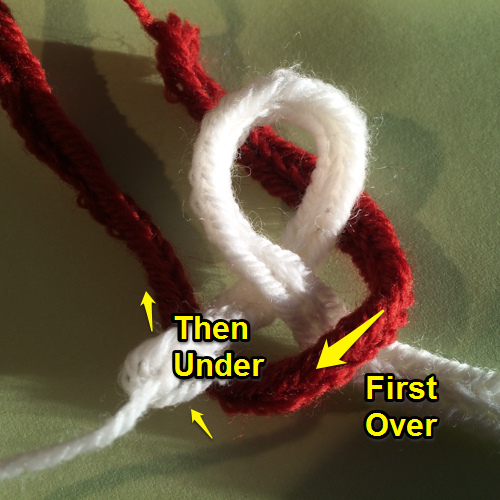 Now you have a pretzel/overhand knot. 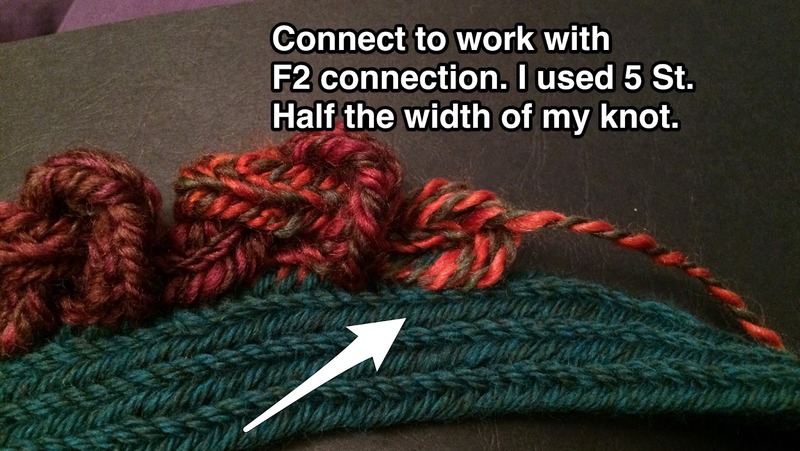 Attach it to the previous row with the F2 connection for stitches that equal half the width of your pretzel knot. 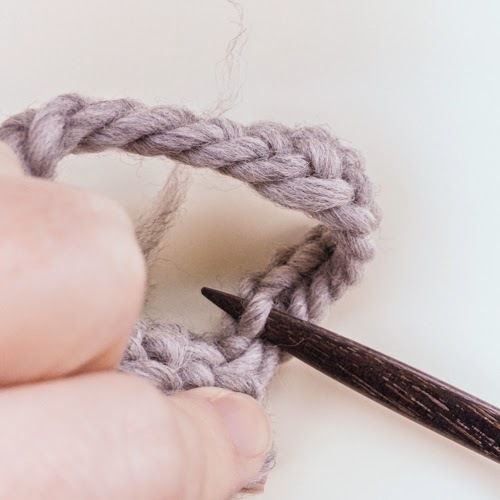 Nalbinding Stitch Connections – What are F1, B1, etc? A few days ago, I saw a nalbound sock on one of the Facebook nalbinding groups, and wasn’t sure how the creator did that effect. She didn’t answer (and I wasn’t surprised – the group isn’t in English and that’s all I speak). 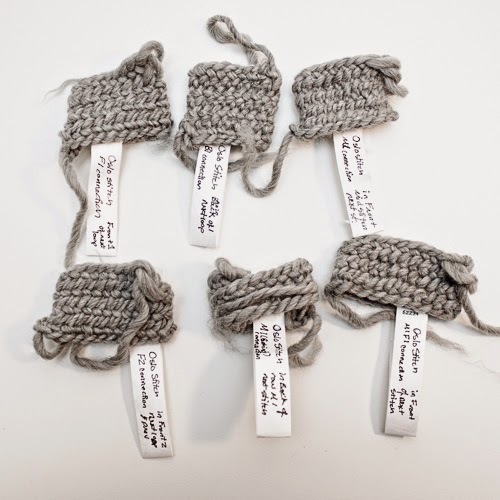 So I worked on a set of samples, so I could figure out that ridged effect and so I could more clearly see the difference between different types of connections for nalbinding. Here are my samples and what I learned. 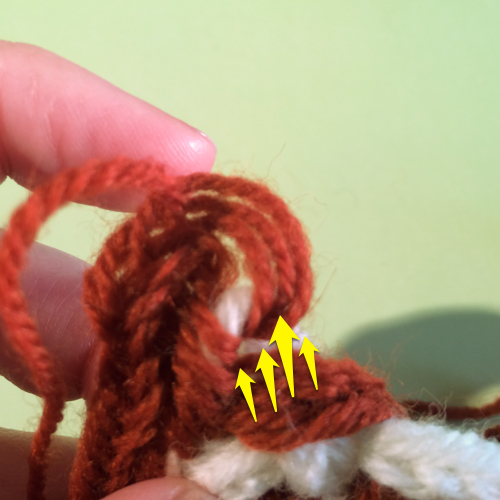 Nalbinding Stitch Connection – F1 – You put the needle through the front of the top loop of next stitch in the previous row. A very flexible join to the row. 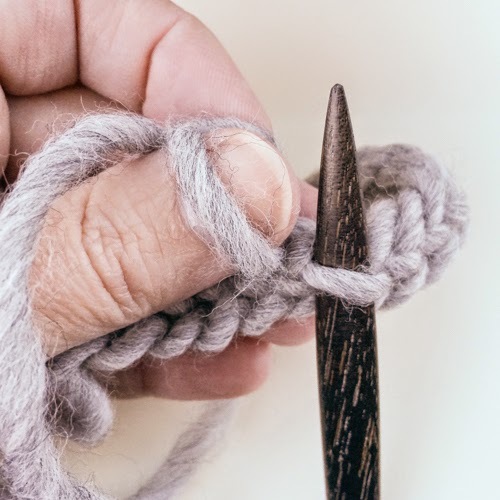 The Oslo stitch has nice drape with this connection. 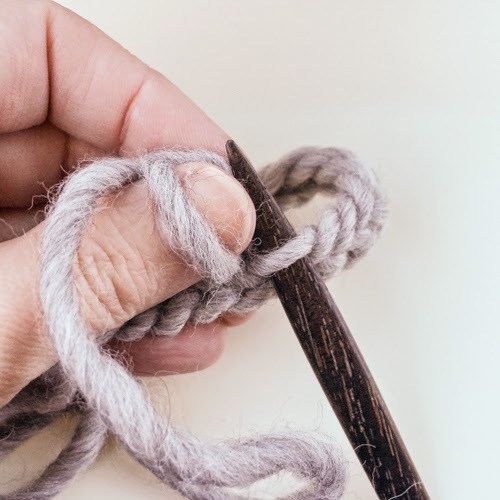 Nalbinding Stitch Connection – F2 – You put the needle in the front of the loop for the next stitch in the previous row, and also the previous stitch in that row (aka the loop that has a stitch in it already). 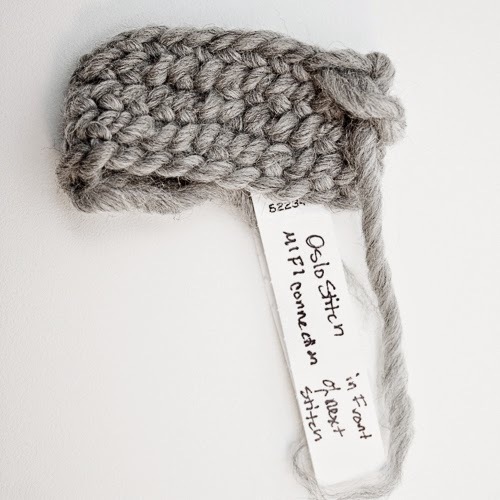 A denser fabric, solid join. 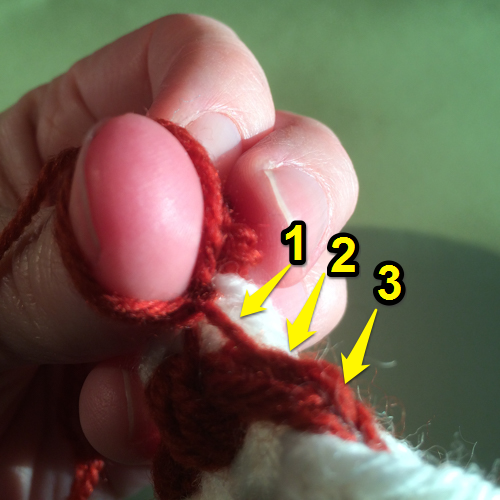 Nalbinding Stitch Connection – B1 – You put the needle through the back of the top loop of next stitch in the previous row. 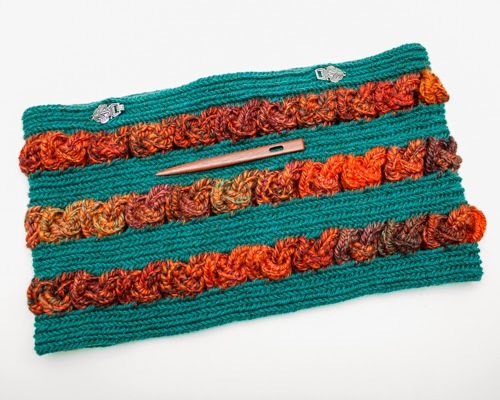 Tighter than the F1 connection and it gives an interesting texture between the rows – almost like weaving. 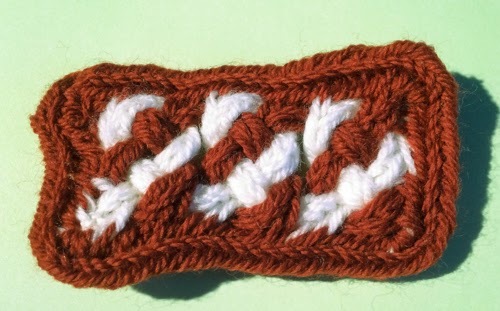 Nalbinding Stitch Connection – M1 – You put the needle through the front of the middle of next stitch (the part of the stitch that lays in the opposite direction) in the previous row. Dense fabric with ridges on the back. 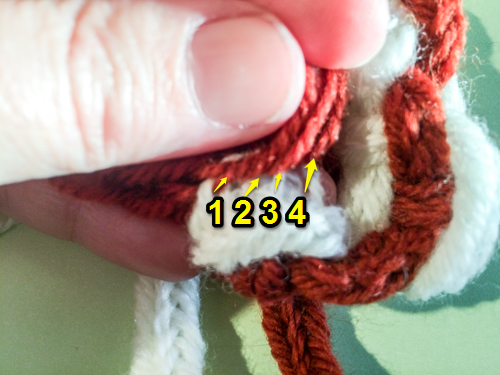 Nalbinding Stitch Connection – M1 in back – You put the needle through the middle of next stitch (the part of the stitch that lays in the opposite direction) on the back side of your work in the previous row. Dense fabric with ridges on the front. 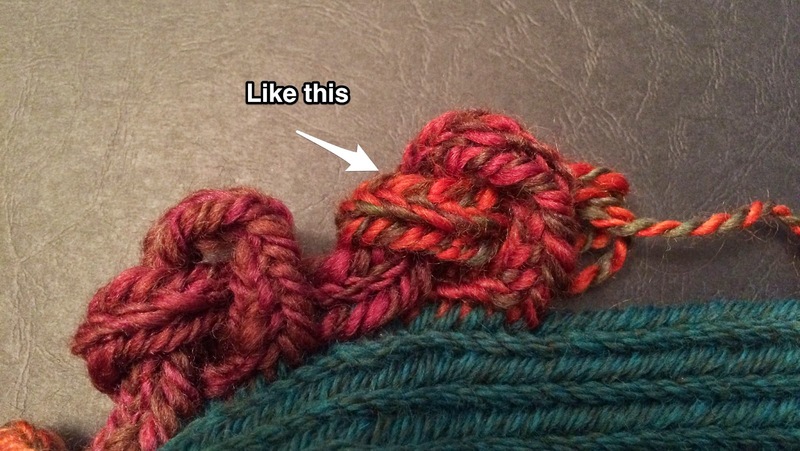 I’m pretty sure this is how the ridged socks were done. 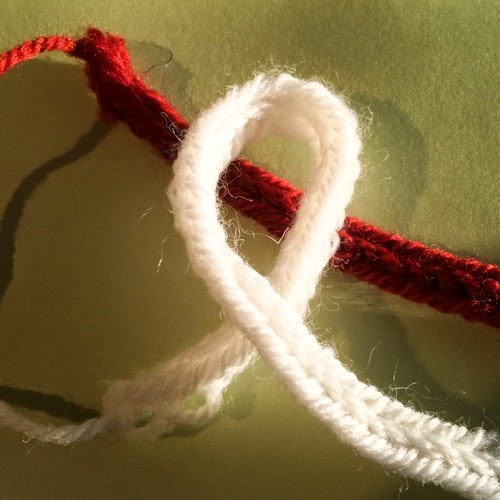 Nalbinding Stitch Connection – M1+F1 – You put the needle through the front of the middle of next stitch (the part of the stitch that lays in the opposite direction) and the top loop of that stitch in the previous row. Dense fabric with no ridges. 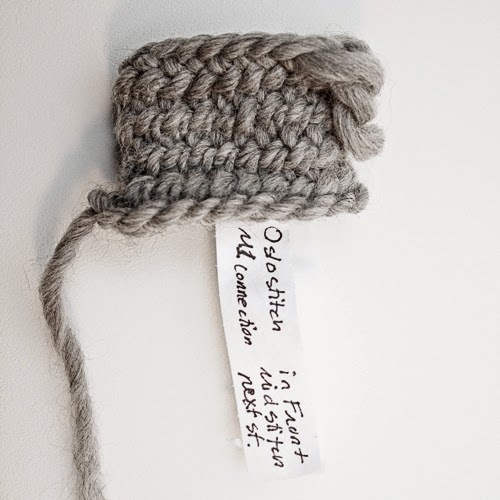 *Note: There is another connection I’ve seen B1+F1 for the Asle stitch. But “B1” means “bottom loop” here. Just so you know. So, there you have it. I’d like to encourage you to make your own samples like this so you can see the difference for yourself. 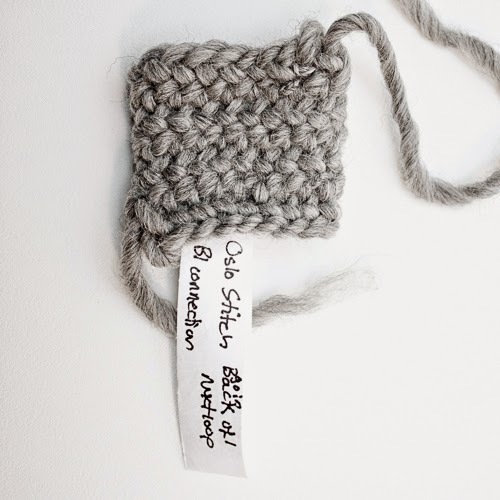 Even different stitch samples are helpful to see what you may want to use for a project. I’d love to see your samples and hear what you learned from them!